Standing in the breezeway of the settler’s dog-trot cabin, the sod roof sheds sandy sparks when the wind rises. Moisture from the dirt floor has been trawled by a broom so many times, it’s glossy in spots. And cold and hard as concrete. 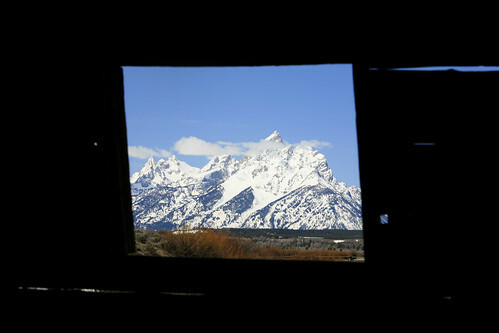 The single window of the home lopsidedly frames the massive Tetons. To enjoy the view straight-on it’s necessary to kneel beneath the low ceiling. On my knees to photograph the scene, the cold seeps through my jeans. The sharp, snow covered crags cause my eyes to glance away for the softer bits of stray light coming through the gaps in the lodgepole pine logs. A powerful stroke of wind puffs the heavy snow into swirls covering the upper peaks of the mountains. It quickly chases down the cabin. Pulling my coat tighter around me, a few steps land me back in the warmth of the May sun. Standing at the back of the cabin, the ancient panoptic beauty of these mountains rivets my attention and the discomfort of the chill is momentarily forgotten. The next blast of air turns my head back to the cabin. There, in between the pioneer’s only separation from the elements and the view of which I can never get enough, their struggle comes to life. The truth is one of the most photographed, most photogenic scenes in America was of little consolation in the isolation of the brutal environment. According to the Homestead Act of 1862, five years of residence on the property along with cultivation of the land was required to call it your own. The problem was, well, there were a lot of problems. The ability to cultivate had to be arrived at. With only 60 days of a frost free growing season, limited access to water, and land choked with willows and aspen brush, many pioneers managed to clear less than 20 acres during the 5 year term. 1911 2 acres veg. cattle got it. 1912 3 acres ½ acre veg. 1 ton. 1914 No crop too dry. 1915 3 acres cattle got it. 1916 3 acres 1 a.veg. ¼ ton veg. Six years of body battering labor shared in a cursive 30 word preemption document, entitled a settler to 160 acres in Jackson Hole, Wyoming in 1918. His work had just begun. I worked for GTLC in the Tetons summer of ’86, then in Jackson ’87. The valley and those mountains, for those who’ve been lucky enough to live in it and under them, are magical. I’m on my second copy of the referred-to poster, found it at a bookstore in Jackson. Just stumbled onto your site, nicely done! Thou writest good…keep it up! I also have been searching for the poster. I lived in JH for 10 years and I lost my picture. I love the Tetons. I worked for GLTC in 85,86 and 88. I got to hike several peaks but never the Grand Teton. I am jealous. The mountains are addicting. I am forever searching for another poster of the Patriarch Tree. 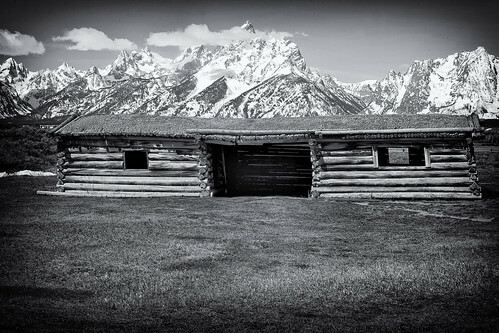 Paul Frederick Martin took the most awesome photo and added the quote from Helen Mettler “God bless Wyoming and keep it wild” It was the last entry in her diary. She died at 15 years old. She said it well. If anyone knows where I can get another print I wuld love to know. Happy adventuring. Great post! I love the picture framed by the cabin window with the bits of light filtering through. Beautiful place. I found your site through your mom and blissfully enjoying your stories and photos. Stunning shots – I especially love your ability to pluck out contrasts that give additional drama. Just great. What a view! I can’t imagine how hard that 5 years could be. Been to JH. Nothing but rocks. No wonder the cows got the garden. But the view… breathtaking! I might have tried it just for that. Wonderful post.